This is a wonderful Baroque silver framed reliquary pendant, dating to the 17th century. It contains a relic of Saint Elizabeth of Aragon. She was beatified in 1526 and canonized by Pope Urban VIII on 25 May 1625. This relic would date to her canonization in 1625, or after the Poor Clares moved her mortal remains to the Monastery of Santa Clara-a-Nova (in Coimbra). Her body was transferred to the main chapel, where it was buried in a sarcophagus of silver and crystal. 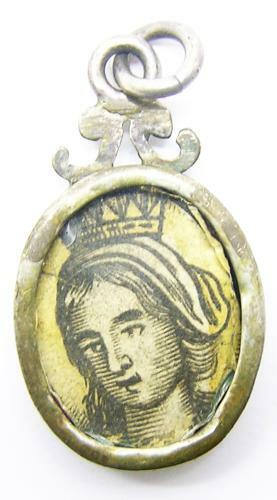 Relics were often taken by devotees, the image on the reverse is an original woodcut on parchment, depicting Saint Elizabeth, crowned as befitting her station as a Queen. The relic is glazed and retains the original suspension loop.